Seltza Spaghetti Head is one of many 3"x5" drawings that I started in one session, added to in another, and completed in a third. Some areas remain seemingly unfinished or underdeveloped because I was impatient and wanted to finish the drawing and move on to another. This irregularity is intentional, furthermore, and lends itself to the uniqueness of my style and artistic decisions. Part of the comedy of these particular drawings is found in the way it is or isn't complete. 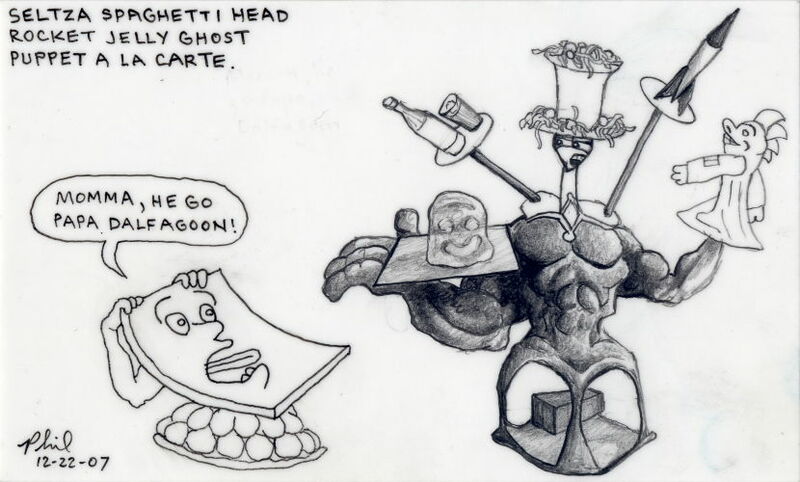 The situation of Seltza Spaghetti Head is a restaurant waiter serving food and entertainment all rolled in one. While upper class citizens would probably be disgusted with the presentation, the restaurant provides a fun, family environment. Timmy, the plastic sheet turtle shell is caught off guard and is somehow alarmed by the oddly adorned waiter. Timmy exclaims something to his mom, who is presumably sitting nearby at a table. It is possible that Timmy recognizes the waiter as a sinister foe in disguise. He may be trying to communicate this distress, knowing that trouble will follow.